Anecdotally, private company investors I’ve spoken to are nervous about market conditions for startup investing. I’ve had conversations with several VCs who told me their fund decided to back off on seed and Series A deals in Q4, instead focusing on follow-on in existing portfolio companies and battening down the hatches on their biggest and most promising bets. There has been a noticeable uptick in Twitter chatter, and posts like Fred Wilson’s “Tightening Your Belt” and Fabrice Grinda’s “Macro perspective: The startup party is far from over!” hint at the content of board room and partner meeting conversations at startups across the country. In today’s analysis, I looked at deal volumes and median round sizes to get a sense of how deal flow and prices have been trending over the past few years. While Series A, B, and C rounds seem to have remained fairly stable (graphs coming in our year-end venture capital report — make sure to subscribe to our newsletter to receive it for free!) 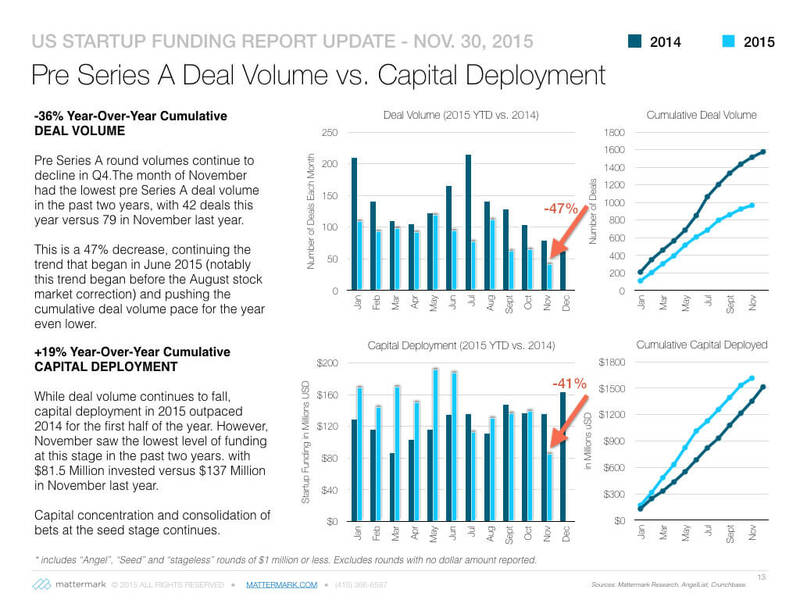 this may have to do with a longer lag time between term sheet to close to announcement than seed rounds. However, Pre Series A round volumes have continued their decline and while this trend appeared to begin with a greater capital concentration but similar overall capital deployment to last year, we are now seeing a slowdown in capital as well with November of this year down 41% from last year’s pace. Overall, Pre Series A deal volume are down 36% year-over-year, and November 2015 volume was down 47% compared to the same month last year. Overall, capital deployment is up 19% for the year, but a closer look at the year-to-year chart shows a significant decline from the highs of June 2015 and this year is no longer outpacing last year. In fact, November this year shows a 41% decrease in capital deployed over the same month last year. For those who live on “Internet time” let me remind you that the end of August saw a significant slump in the stock market, September saw a volatile initial recovery, October kicked off a massive rally, and November has bounced around quite a bit and is up dramatically today. It’s been a bumpy ride these last few months, with no end to public market volatility in sight.